An elegant pure pink wedding cake decorated with edible sugar ruffles. 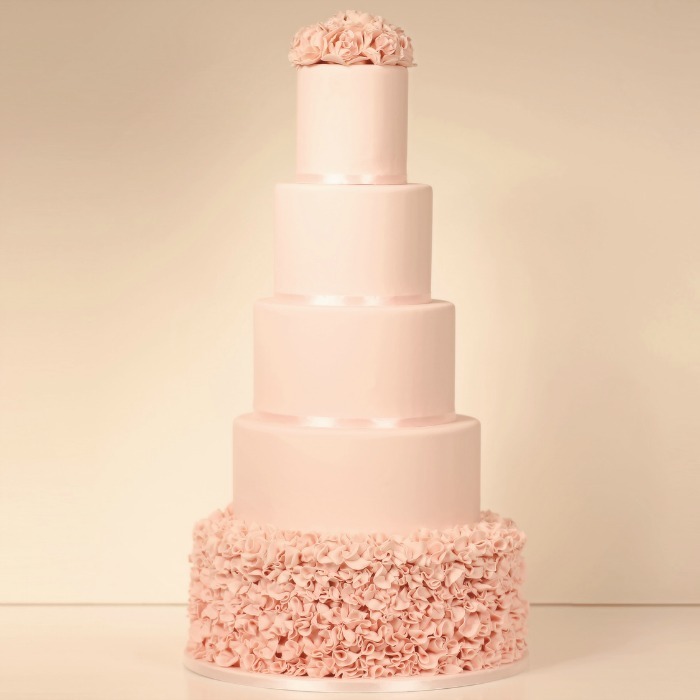 This cake is designed as an elegant, show stopping centrepiece for your dream day. DessertVille works closely with couples to design the perfect wedding cake that their guests will be talking about for years to come. This five tier cake sizes are 12, 10, 8, 6 and 4 inches which can serve up to 180 guests. Please allow at least 3 months notice when ordering this cake, but any shorter notice can be discussed (please use the "contact the Maker" button on this page). Choose your preferred delivery date at checkout. This cake can be delivered a day before your event. Hand delivery within London is free, for deliveries outside of the M25 the delivery charge is £50 please choose that delivery option at checkout. Please use the "Contact the Maker" button on this page to get in touch!